American food diners are popping up all over London town – and now us folks south of the river finally have a serious contender, Red Dog South. The American Authentic BBQ joint is tucked away behind Clapham High Street and the menu includes guilty pleasures such as mac ‘n’ cheese, pit-cooked pulled pork burgers and boozy butterscotch ice-cream sundaes. Healthy, it is not. But we all need a cheat day, right? The diner is a mere 5 minutes walk from my house, so I predict weekly trips to the restaurant, which is sister to Red Dog Saloon in Hoxton square. Also on the menu are buffalo wings, 12 hour brisket, meaty beans and burnt ends pie. The cocktail menu is limited, but the watermelon martini acted as a great palette cleanser between the courses. THAT is The Devastator. 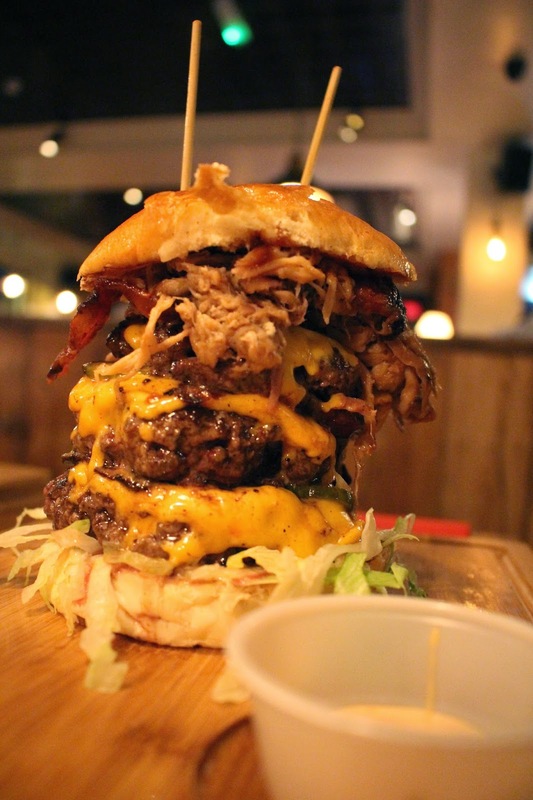 With 18 oz of steak patties, 6 slices of American cheese, 200g of pit-cooked pulled pork and 6 slices of smoked bacon. Of course no american-style restaurant would be complete without a Man Vs Food style challenge; The Devastator Challenge. Willing diners have to devour the whole burger, large fries and a large milkshake in 10 minutes. Charlie managed to eat the lot, but in over 10 minutes, so while he was applauded as one of the first to complete the challenge at the Clapham branch, his name won’t go on the wall of fame! While the desert menu looked epic, there was no way we could squeeze any more in, so we’ll just have to save that for next time! Red Dog South has arrived just in time for summer, with a large heated terrace and enough beer and cocktails to keep us happy, so if you love your dinner to be big and meaty, Red Dog South is definitely somewhere you have to sample. What’s your favourite Burger joint in London?